Gold Jewelry has been used for adornment by nearly every culture throughout human history and around the globe. 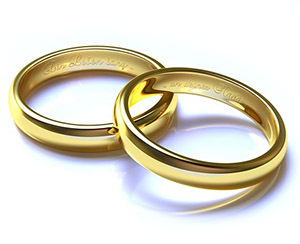 Our most significant items continue to be cast or arrayed in gold: wedding rings, crucifixes and other sacred objects, awards such as Olympic medals, Oscars and Grammys. Whether because of its rarity, its natural beauty or its association with wealth, gold’s primary use has always been in jewelry. Jewelry has been used for adornment by nearly every culture throughout human history and around the globe. Our most significant items continue to be cast or arrayed in gold: wedding rings, crucifixes and other sacred objects, awards such as Olympic medals, Oscars and Grammys. Whether because of its rarity, its natural beauty or its association with wealth, gold’s primary use has always been in jewelry. Today, between 75 and 78 percent of all gold produced in the world is used in jewelry. Gold has other uses, of course: in modern dentistry, for instance; in electrical wiring; even in window tinting. However, its primary use throughout history has been for beautification. Gold has certain, unique properties that make it ideal for jewelry-making. It has a natural luster and a rare and appealing yellow color. But beyond these aesthetic qualities, gold has practical qualities that make it well-suited to jewelry production. Gold is ductile; that is, it can be stretched and drawn into thin wires. It is malleable, meaning it can be hammered into sheets or molded into a variety of shapes. These characteristics make it quite easy for people—even using the simplest or most primitive tools—to work gold into a variety of beautiful objects. Further, gold is almost entirely resistant to corrosion. It can be exposed to unlimited amounts of air and moisture and come through unchanged. That is why for jewelry items, which are exposed to oxidation and perspiration and which are often handed down from generation to generation, gold is an ideal material. 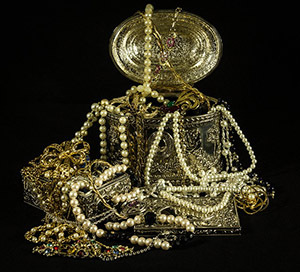 Pure gold, however, often proves too soft for use in many pieces of jewelry—especially those which will be worn on a daily basis and therefore must be able to suffer some abuse. This is why jewelry makers often alloy (or mix) gold with other metals. Alloyed with copper, silver or platinum, for instance, gold becomes much more durable. Today most gold jewelry is not made from pure gold but from an alloy of gold with one or more other metals. A further benefit results from alloying gold with certain metals: the gold can be given a range of hues depending on the metal with which is alloyed (white, red, blue, green, etc.). Blue gold can be made by alloying it with iron, and purple gold can be made by alloying it with aluminum. Such hued forms of gold are pretty rare in jewelry. White gold, on the other hand, has become very popular in recent years. It is the result of alloying gold with silver, palladium or other white metals. As far as value goes, alloys of gold have a lower value than pure gold. 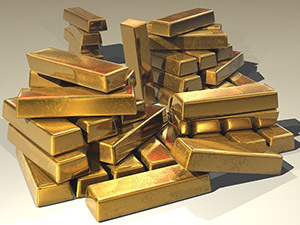 The gold content of an item is measured in karats, with pure gold weighing in 24 karats. An alloy with 50 percent gold by weight is designated 12 karat gold; an item containing 75 percent gold by weight is called 18 karat. Due to gold’s aesthetic and practical characteristics, its use in jewelry and other forms of adornment seems to have been inevitable. Nearly every civilization has used it for beautification in one form or another. Modern practices of refining and alloying the precious metal have increased the practicality of gold jewelry. But even before such practices were discovered, gold and jewelry seemed to be a natural fit.